I love the holiday season in Manhattan so much that I don’t even mind the crush of holiday shoppers. I’m particularly fond of the holiday markets that pop up around town; they often solve my gift-buying needs for girlfriends, female relatives and acquaintances. Yesterday, I stopped by the Union Square Market and was quite surprised to see that skull fashions had taken over the holiday gift market. Originally seen as edgy “skater fashion,” clothing and accessories adorned with skulls seems to have become as mainstream (at least in NYC) as skinny jeans tucked in tall boots. Skull fashions were everywhere, but Brooklyn Charm was by far the busiest vendor on the day I was at the market. The vendor seems to specialize in “create-your-own” charm jewelry. Check the site’s Etsy pages to get a closer view. I had no idea there were so many lovely charm possibilities! I love giving and receiving gifts of a pampering kind—gorgeous smelling exfoliants, soaps and lotions or, perhaps, a soy candle that doubles as massage therapy. This year, I went a little nutsy at a vendor called NIO-Made with Love. I tested out the salt and oil body scrub and bought them in every scent and even one for myself. They’re so easy to use: rub two teaspoons all over your body before you step into the shower once a week. The days of having to buy gifts for my children's school teachers, coaches, violin teachers and so forth are long over. Still, there are a number of women who I like to give a little something to say "Season's Greetings!" I've always loved the wedges of soap that you find a markets. This year, I decided to give a sample of soaps to various female acquaintances. Do you have a friend who's ga-ga for gardening? I do. She also love miniatures. 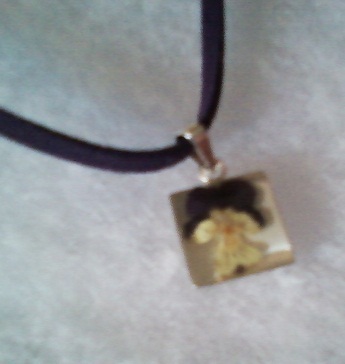 So when I came upon a vendor that sells charms with miniature pressed flowers, I had to stop. The vendor, The Fast Turtle, had a lovely collection of charms made with real miniature pressed flowers, such as pansies and forget-me-nots, in various sizes. There were also pretty bracelets. According to its website, the Fast Turtle has been in business for 11 years. Unfortunately, the company hasn't been too fast about developing a shopping website. However, they do want you to contact them if you'd like to learn more about the jewelry. Finally, one of my favorite finds was a vendor selling Symphony Handmade Seed Paper products. 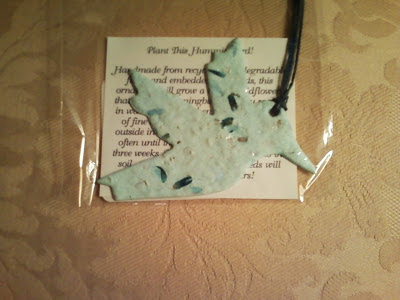 I bought a bunch of other tree ornaments while I was at the market, but I love the hummingbird (below) made from recycled paper loaded with wildflower seeds. All my favorite girlfriends and sisters are getting one of these. Who doesn't love hummingbirds and next spring, the gals can plant them in their gardens. You can learn about the company's various products at its website.